IRETA tailors consulting services to our client’s specific needs. We spend time understanding your process and problems. We look at data, meet with staff and stakeholders, conduct focus groups, and observe interactions with patients/consumers. From there, we devise a change plan that fits the outcomes our clients want to achieve. We gather baseline evaluation data and become acquainted with our client’s clinical and/or administrative processes. Depending on the client, data gathering can take many forms, including observation, staff interviews, and participant outcomes. We present feedback on the program’s performance and work collaboratively with the client to identify the effective change process that fits the program’s needs. We offer trainings, coaching, supervision, and implementation assistance with new practices and processes. 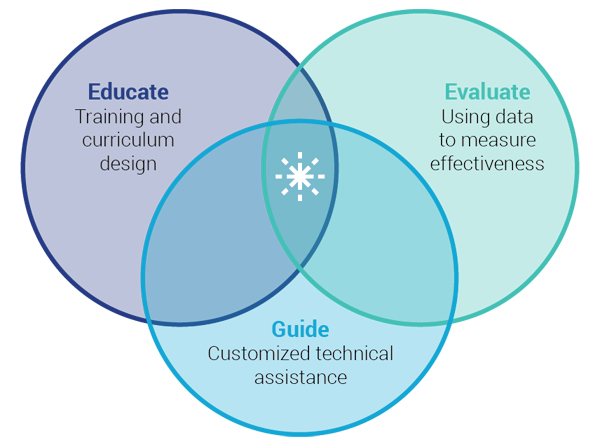 During this period, we emphasize the importance of the program becoming familiar with and–most importantly–using its own data as a matter of regular practice. We gather evaluation data and help the client install processes and structures to sustain change. RISE engaged IRETA to facilitate a two-year quality improvement program that included the rapid cycle PDSA tool (Plan – Do – Study – Act).